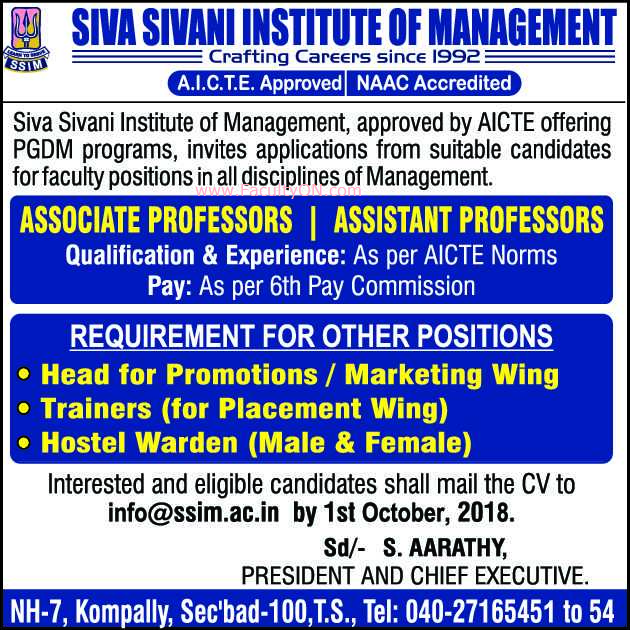 Siva Sivani Institute of Management, Secunderabad has advertised in THE HINDU Opportunities newspaper for the recruitment of Teaching Faculty- Associate Professor / Assistant Professor Plus Non-Faculty jobs vacancies. Interested and eligible job aspirants are requested to apply on or before 01st October 2018. Check out further more details below. About College: Siva Sivani Institute of Management (SSIM), specialized in PGDM course, has been consistently ranked among the top business schools in India. In a B-school survey conducted in 2016-17 by Career 360 Magazine, the SSIM was ranked 34th in the country among the Private Business schools with a rating of AAA+. As Per CSR -GHRDC B-School Survey 2017 35th among Private B-Schools in India,Top B-Schools of super Excellence and 1st among Private B-school of Telangana.